state of the art media technology. ductions, chorus and talent shows. Science Test, DLM and the APA. to report on student progress. the needs of their child. Click for information on Advanced Placement Courses offered at Shepard Preparatory High School Click here to download our Health and Wellness Policy Click to download our brochure. policies, educational policies, scholarships, and loan programs, and athletic and other school administered programs. Where is Shepard Schools located? We are located in historic Morristown, NJ and Kinnelon, NJ. How long has Shepard Schools been existence? Shepard Schools has been in operation since 1991. Approximately how students attend Shepard Schools? There are approximately 80 students in Shepard Preparatory High School in Morristown, NJ and 40 students at Shepard School in Kinnelon. How do I know which program, Shepard Preparatory High School or Shepard School Satellite High School is more suitable for my child? The student who attends Shepard Preparatory High School is generally able to do grade level work and participate in college preparatory classes, with some mild modifications. This student is likely to go on to a two or four year college program after high school. The student who attends Shepard School Satellite High School tends to experience a significant learning and/or behavioral disability, and is likely to pursue (and/or need) a more vocationally oriented secondary school curriculum. What kind of student attends Shepard Schools? Students who attend Shepard Schools are students who have the potential to be academically and socially successful, but have been unable to utilize their potentials in a regular, mainstream educational setting even with maximum special education programming and support. This circumstance can arise from any number of factors, but most students who attend Shepard generally want to maintain or get back on the academic path, complete high school and go onto to a successful post-secondary experience. Which towns do Shepard students commute from? Students have been placed from over 90 different Northern and Central New Jersey school districts. We also have had students that come from NYC, Staten Island and some of the NYC suburbs. How long is the bus ride to Shepard Schools? The length of the bus ride will depend upon the student's start and drop-off destination. These arrangements are generally made by the student's child study team. Typically, our students may have a 20 to 30 minute bus ride, depending on the bus route set up by the student's transportation company. Once a student is placed at Shepard Schools, will my student still have contact with his/her home school? 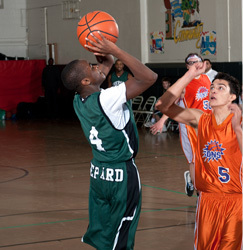 Practically all our students have access to the extracurricular activities in their sending district. This means that they can participate in sports, clubs, drama, music productions, dances, graduation activities etc. This arrangement is managed by the child's case manager, on the Child Study Team. Does Shepard Schools have any after school extracurricular activities? Shepard Schools offer an After School Program (Monday-Thursday) for interested students where they can get homework help and participate in recreational activities. Most of our extracurricular activities occur during the school day. This includes clubs, sports, drama and music productions. There is also an occasional weeknight trip planned for a Broadway show or professional sports event. Do students cultivate friendships outside of school with their classmates? We encourage and foster the development of positive social and interaction skills through out the school day. It is a matter of the student's personal choice if a student contacts and gets together with another Shepard student outside of school. Typically, we will make parents aware of the social choices the students are making during the school day. We provide students with a great deal of coaching about making and maintaining positive relationships when they are not in school. How are parents involved in the Shepard Schools program? Parents engage in a weekly phone conference from the student's homeroom teacher (or e-mail, if the parents prefer), about the student's ongoing progress. The teacher will provide weekly updates about how the student is doing in class, both academically and socially. Parents are also invited to participate in periodic Parent Group that meets about eight times during the school year. This provides an opportunity for parents to meet the parents of other students, obtain important information (i.e. College Preparation) and meet the students' school counselors. Parents also are encouraged to attend Back-to-School Night, and our many musical, drama, art and sports events. Do the student and parents still have contact with the Child Study Team after the student is placed at Shepard? Child study teams are routinely appraised of their student's performance culminating in the IEP annual review. When can students apply to Shepard Schools? It is always best to start a new school at the beginning of a school year. However, this is not always possible. Due to the unique, individualized nature of our programs, we are able to start new students throughout the school year, depending upon the availability of an opening in our classrooms. Do students ever return to district after starting at Shepard Schools? There are some students who return to district after spending at least a school year at Shepard. These students have become more behaviorally and academically competent, and are better ready to handle the challenges of a mainstream setting. However, there are more students who choose to stay at Shepard for several years and/or throughout their high school because the Shepard programs best suit their learning and emotional needs. Does Shepard Schools participate in a half-time program with vocational schools? Shepard Schools may accept a student on a half-time basis during their junior or senior year if there is a part-time opening at Shepard, and the student has been accepted at a NJ Vocational School (usually Morris County Vocational School). The sending district is responsible for making the arrangements and tuition to the Vocational School. What kind of career and/or post secondary planning is available? Students who attend the Shepard Preparatory High School Program start discussing career interests as early as 10th grade. Students will complete a Career Interest Inventory and explore post secondary options as part of their Group Counseling Program. We offer the PSAT and SAT on site. Students will also get personal assistance in starting and completing all aspects of the college application and acceptance process. 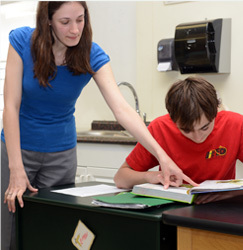 Career exploration and planning is infused throughout the Satellite High School in Kinnelon starting in the 9th grade. 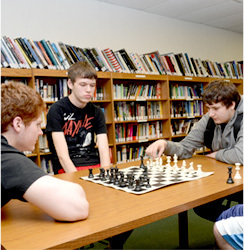 Students participate in class activities that have relevant life meaning and career exploration. They can become involved in the Transition, School to Work Program in the 11th grade, where they will actually engage in job sampling and, in some circumstances, be placed in a paid work setting. There is also a 5th Year Transition Program for students who have completed 12th grade, and are interested in supported employment. Students capable of attending a county college as a post-graduation plan have access to the full array of guidance services necessary for this transition. Additionally, Shepard Schools encourages linkages to post-secondary agencies such as Division of Vocational Rehabilitation Services and Department of Developmental Disabilities. Are the NJ State Proficiency Assessments (HSPA, APA, ASK 7, ASK 8, etc.) taken at Shepard? Yes, Shepard students are able to take all the NJ State Assessments on site. Are the PSAT and SAT offered at Shepard Schools? How does Shepard Schools strive to promote the behavioral, emotional and academic success of students? Shepard School employs a positive, behavior modification plan that promotes the development of self-esteem and self-competency. Students are able to earn academic and behavior points during each class period which enables to them not only to feel a sense of accomplishment, but teaches them to track and control their own behavior, entitles them to special privileges and tangible rewards. For example, the student can use their points to buy items in the School Store. Some students have saved enough points to buy things such as iPods, PlayStations etc. 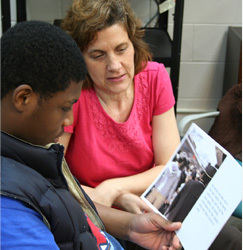 Students also maintain individual counseling plans with their school counselor whom they see twice weekly. Students and the counselor meet to address whatever behavioral and/or emotional that may impede the student's academic success. Additionally, the student receives ongoing coaching in the classroom from certified teachers and trained aides, with regard to social skills development and emotional management. We also have crisis staff immediately at the ready, as well as social skills training programs, anger management groups and art therapy available for those students who need these services. How does the student make application to Shepard Schools? Parents and Child Study Team Professionals are encouraged to call Mr. Frank Cocuzza for further information. To set up an intake meeting and tour of Shepard Schools, contact Ms. Teri Schafer. Both can be reached at (973)984-1600.